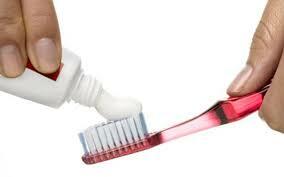 Everyone is familiar and use toothpaste to clean your teeth regularly. But toothpaste also has many additional benefits that may never know. Toothpaste is a good helper for you to clean something. Now, see 10 benefits of toothpaste which can help you do something. Deodorant hand. The smell of garlic and onion smells fishy. Use a Toothpaste, rub hands until the odor disappears. While washing your hands, it will help eliminate the fishy odor. Eliminate Acne. Acne heals faster Try applying toothpaste on pimples and leave it overnight. Then wash it in the morning. Acne would collapse faster. To remove scratches on CD. Scratches on CDs For stains and superficial scratches. The toothpaste smeared onto the scratches using a fabric to scrub, then rinse with clean water. Wipe silverware. Smeared Toothpaste on silverware, scrub leave it for about one night after a soft cloth to wipe it clean. It will shine up. Burn stains from iron. Use toothpaste scrub on Ironing. Then wipe clean the stain, will get a clean Iron and can iron smoothed again. Iron stain on iron we can use the toothpaste helps to eliminate by scrub the Ironing yet. Ingrown nails Treatment. Use toothpaste smeared on ingrown nail area, but before use toothpaste cleans the wound thoroughly. To take some time to treat ingrown nails and then new nail will grow to replace the old ingrown nails. Treatment poisonous insect bites. Use toothpaste applied to the wound area. It will relieve burning, itching, swelling and bruising of the skin to relieve itching and reduce the swelling down. Symptoms include a burning sensation when the skin was hot. The blisters have dried and toothpaste to keep the wound heals faster. It should be left overnight for the best results. Use for a shoe shine. Clean the shoes dirty which can not wash by water. By smearing toothpaste on the stain and then wipe clean within the same way as clothing and carpets. To remove stains accumulated on both sneakers and leather shoes. Toothpaste smeared to thorough brush then wipes it clean. Clean nails. Both nails and teeth have the component of bones. We can use toothpaste apply to nail or toenail. Apply toothpaste on a toothbrush or small brush to scrub nail or toenail regularly to keep nails clean, healthy and shine. Don’t forget to use brush and toothpaste to scrub nail regularly to keep nails clean, shiny and stronger. To remove stains. The stains on clothes, shoes, use toothpaste smeared on a stain. Brush until the stain fades, then washed or wiped clean normally for shoes. We have clothes or shoes that look beautiful again. But remember that do not use a toothpaste which containing teeth white with color clothes. This may cause a color is faded. I hope this articles will have some use for you. 9 techniques to make your bright brain. For someone love gaming, hear is top 10 best gaming keyboards.